Lance 9 months old - Photo by G. Echols Edited by Betsy Bozung. It took almost eighteen months to find Emma a new dog. There were either no pups available or breeders would not commit to allowing a Junior Handler to own one of their best pups. I went on a mission to find her a nice dog to show, and sent out many emails to breeders all over the country. After lots of research, and telephone calls we found a puppy available from Tangletop Yorkshire Terriers (Nan Schmidt) who had the Exmoor, Rothby, and Stardust lines represented in the pedigree. We drove all the way up to Indiana to take a look. As soon as we laid eyes on him we knew we had found our show boy. Emma named her new puppy "Lance Tour de Force" after six time Tour de France winner Lance Armstrong. She started him in the show ring at six months of age, and he took her all the way to the top in Junior Showmanship. She finished his UKC championship in one weekend at the "Georgia State UKC Regional Championships", where he also took "UKC Reserve Best In Show" to Kenny Gonzales of "Taylor Made Kennels" American Bull Terrier UKC/AKC NGRCH, GRCH "PR" "Legacy's O Malosi Aua". It was a very exciting day, and Emma got to congratulate Mr. Gonzales on his big win. Later on, Emma was sought after by the local cable TV news media for a personal interview regarding her win. Lance had a presence that made you look at him. He wasn't perfect, but he knew what he was born to do, and Emma ended the year out as the number one Junior Handler for Yorkshire Terriers in the USA. Then, to top it all off on January 3, 2009 Emma finished his AKC Championship. She had done her job well, and was again awarded AKC Top Junior Handler for her breed. She is currently ranked #1 in Breed, #2 over-all in Toy Dogs, and has ranked #17 in All Breed Dogs, and has invitations to show at both the upcoming Eukanuba and Westminster Dog Shows. On February 8th, 2009 she traveled up to New York to participate in her first YTCNY Specialty. 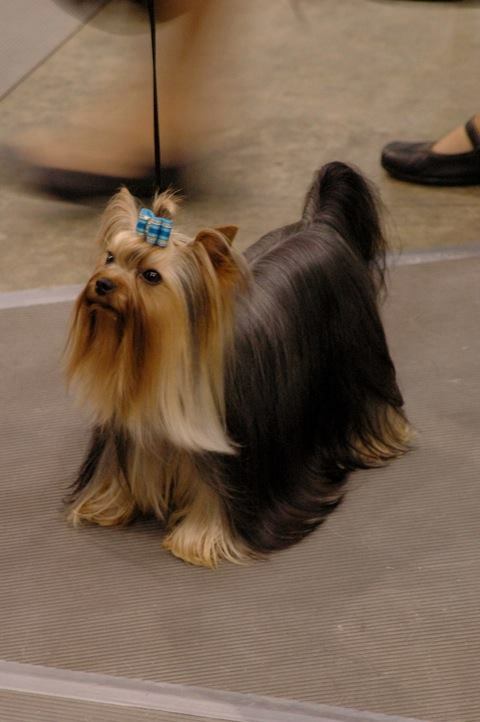 She exhibited her dog along side some of the best Yorkshire Terriers and handlers from all over the world. It was a very exciting time for her as "The Westminster Kennel Club" was also being held at Madison Square Gardens the same week. She had the thrill of seeing her favorite Yorkie "TyAva's Sure Shot" (Chandler) win Best of Breed. She also enjoyed participating in the AKC Junior Awards Banquet at the Philadelphia Hotel in New York. She got to wear a real cocktail dress, and high heels for the very first time.... We had a great time in New York City and enjoyed seeing the sights. Lance at Brooksville, Florida. Emma takes First Place in Juniors. 4th win of the year, and it's only January....Lance loves the grass at Brooksville. Emma and her big sister Kirsty at Kennessaw Kennel Club.